Please join us and our Patrons Dame Sarah Storey DBE, Alan Shearer OBE, Professor Andrew Baildam and Andy Burnham, Major of Greater Manchester on Saturday 15th September 2018 for a truly unique evening of fun and entertainment. 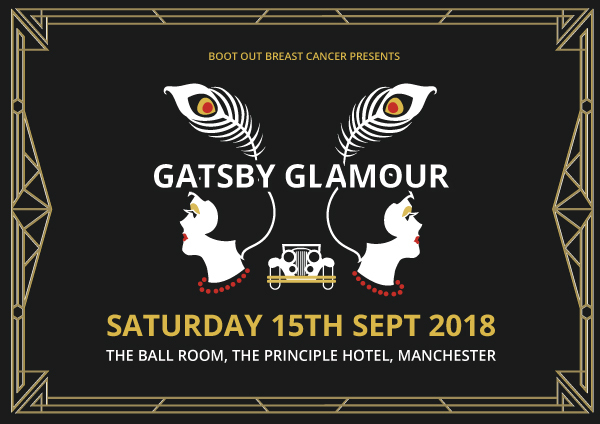 Boot Out Breast Cancer is a charity run entirely by volunteers ensuring every penny raised is spent on the latest state-of-the-art diagnostic equipment for both men and women diagnosed with breast cancer in NHS hospitals. The key to survival is making that early diagnosis and the equipment donated by Boot out Breast Cancer is allowing NHS Consultant Radiologists to make those immediate decisions. The aim of the evening is to raise vital funds to purchase some diagnostic equipment for a local hospital in the North West. The evening starts with a Champagne reception and a fabulous 3 course meal prepared by the executive chef at The Palace followed by some truly first class entertainment. We can guarantee you and your guests a spectacular night full of surprises. Prices are shown below. Sponsorship Packages available. Double page advert in charity ball programme given to guests on the evening.